Alejandra Montoya-Boyer is a native of Albuquerque, New Mexico. She attended New York University (NYU), where she obtained her B.A. in politics and Latino studies, with a minor in mathematics. At NYU, Alejandra was involved with the L.U.C.H.A. student organization and the Latino Studies student executive board. In college and graduate school, Alejandra worked as a math and science tutor for Mexican-American ESL students through the Mexican-American Students’ Alliance in New York City. She also spent seven years working in the technology sector at Apple Inc. and the Guggenheim Museum’s IT department in Manhattan. Her commitment to social justice led her to pursue her studies in education, particularly focused on creating opportunities for Latino students interested in STEM fields. While working at the Guggenheim Museum, she also attended Teachers College at Columbia University, where she earned her M.A. in educational technology and media. While at Columbia, Alejandra was involved with the Coalition of Latino/a Scholars. She also helped produce “The Conversation,” a student-led web series dedicated to discussing social issues within education pertaining to race, gender, undocumented students, and homophobia. Alejandra also worked with the Critical Race Studies in Education Association as a Graduate Student Program Chair and web designer. 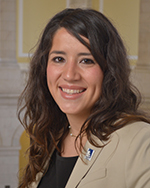 Alejandra has spent the past year in Madrid, Spain teaching English and earning her M.A. in teaching in bilingual education from the Universidad de Alcalá de Henares. As a CHCI Graduate Fellow, Alejandra hopes to gain insight into policy making and the legislative process so she can work effectively for Latinos in Washington, D.C. and for her community back home.